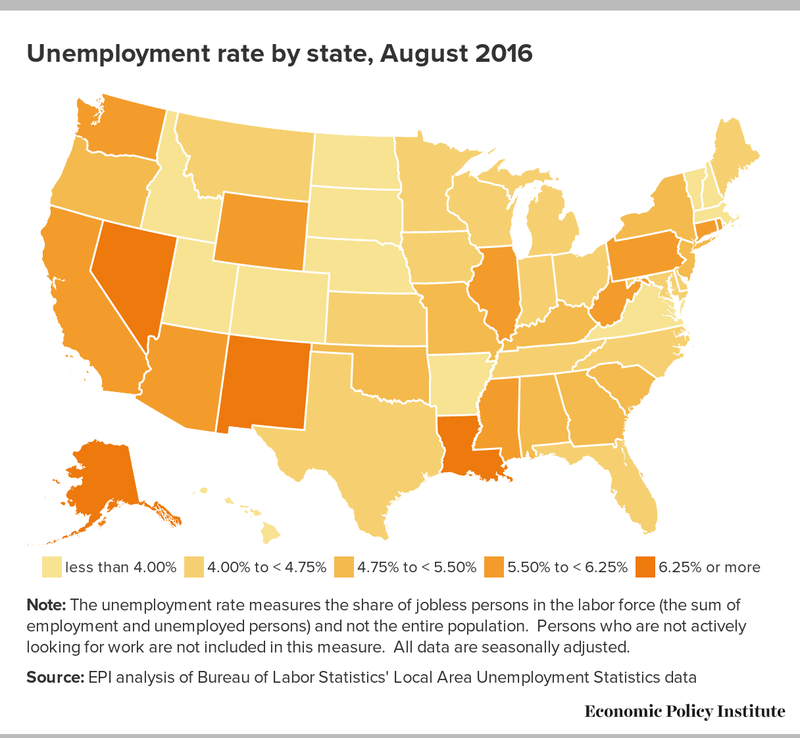 The August State and Regional Employment report, released today by the Bureau of Labor Statistics, showed that most states ended the summer with continued modest job growth and mostly stable rates of unemployment. Unemployment did tick up in many states over the summer, although some of those increases are likely the result of previously discouraged job seekers reentering the labor force. National job growth over the past year (1.7 percent) has outpaced both working-age population growth (1.1 percent) and labor force growth (1.5 percent)—meaning that the country should be adding jobs fast enough to accommodate new entrants to the workforce while reducing unemployment. From May to August, 43 states added jobs, with the largest percentage gains occurring in Nevada (1.6 percent), New Hampshire (1.3 percent), Iowa (0.9 percent), Florida (0.9 percent), and Colorado (0.9 percent). Over the same period, seven states and the District of Columbia lost jobs. Montana (-1.0 percent), Wyoming (-1.0 percent), and West Virginia (-0.9 percent) experienced the largest losses. As of August, eight states (Wyoming, New Mexico, Alabama, Mississippi, Connecticut, Maine, West Virginia, and New Jersey) are still below reached their pre-recession employment levels. In 30 states, the unemployment rate was higher in August than it was in May. The largest increases in unemployment occurred in Oregon (0.9 percentage points), Missouri (0.8 percentage points), and Kansas (0.6 percentage points). From May to August, the unemployment rate fell in 17 states and the District of Columbia. Illinois (-0.9 percentage points), Alabama (-0.6 percentage points), Indiana (-0.5 percentage points), North Carolina (0.5 percentage points), South Carolina (0.5 percentage points), and West Virginia (0.5 percentage points) had the largest declines in unemployment. 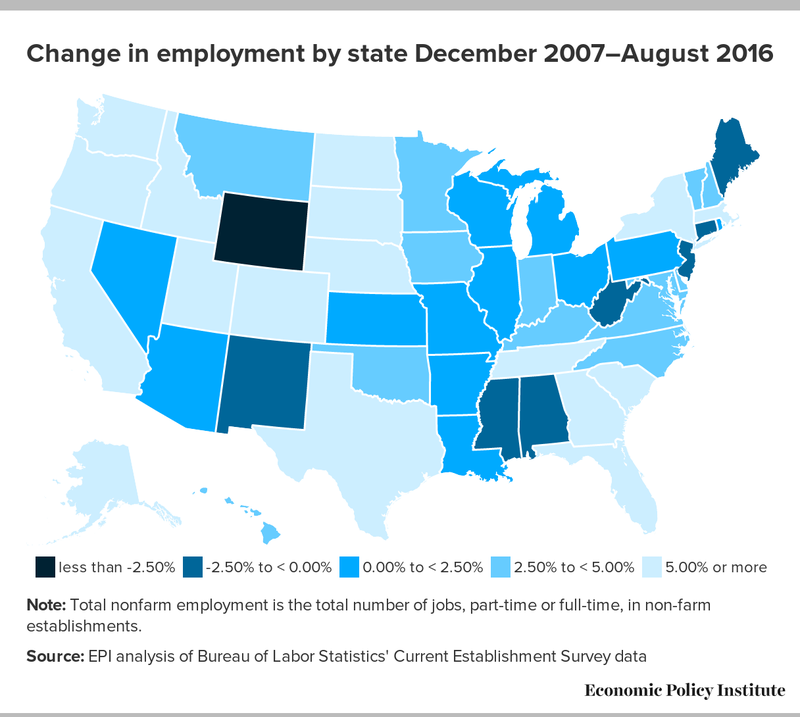 While there is still considerable evidence that the economy has not yet reached full employment, today’s state jobs data affirm that improvements in the labor market are being felt broadly across the country. Last week’s national and state income and poverty data indicated that 2015 was the best year of income and earnings growth for American households since the 1990s, with meaningful income gains in both rural and urban areas. Still, for a truly national economic recovery, policymakers need to address longstanding racial and gender earnings disparities that have long denied prosperity to communities of color, even in times of relative economic health.